Traveling to Iceland? Start Planning Your Dream Trip. How Many Days in Venice is Enough? Some of the links in this post are affiliate links. At no additional cost to you, I may earn a commission if you click through and purchase through any of these links. Opinions are always my own. If you’re interested in Scandinavia but haven’t had the chance to cross the pond to see the Nordics in person, you might consider a trip up to North Dakota this fall. Believe it or not, Minot is home to the largest Scandinavian festival in North America. Tens of thousands of folks from all over the world visit North Dakota each year to celebrate Scandinavian Heritage! Why North Dakota? North Dakota is rich with Scandinavian heritage. The first of many immigrants came from Norway as far back as 1869 to settle in Northern Dakota when the land further east in places such as Iowa and Wisconsin became more difficult to acquire due to popularity and cost. Swedish settlers came later to North Dakota as well as some from Denmark, Finland, and Iceland. Since its inception in 1978, all 5 Scandinavian countries are recognized annually in this festival known as Norsk Høstfest. Norsk Høstfest is an all-out celebration of Scandinavian culture! Held at the North Dakota State Fair Center, each of the 5 countries has its own hall named after its capital. In these halls you can find authentic cuisine, jewelry, and entertainment. 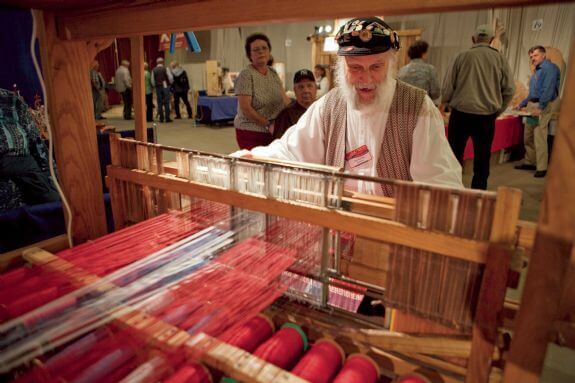 You can shop local artisans and even wander into a Viking Village for a glimpse into the past. If you decide to head out, get ready for a weekend full of live performances, shopping and unique dining experiences. If you’re feeling adventurous, you can even try your hands at making Lefse at the Lefse Masters! Adult General Admission will run you $40 per person while kids 12 and under are free. Teenagers (ages 12-17) are just $10. Your General Admission ticket will get you access to most of what the festival has to offer. The only exclusion to the ticket is the Great Hall performances. If the lineup is of interest, you can purchase a ticket to the concert and your General Admission is included. The Great Hall schedule can be found on the Norsk Høstfest website. Who would of thought you could find a piece of Scandinavia in North Dakota? If you’re looking for a unique experience or want to have fun learning all about the Nordic region, pack the family up and head to Minot this September for food, fun and culture! Learn more about Norsk Høstfest here. Disclaimer: This post was sponsored by Norsk Hostfest. As always, all opinions are my own. Status Codes for SEO Beginners: What In The World Do These Mean?! What a fun activity to do with family!! What a fun experience! I love finding things like this, a little random but so intriguing! Cool experience – I’ve never heard of this before but sounds really fun. Looks like a fun festival! I had no idea about this festival and all the Scandinavian influences in North Dakota! So cool! Neat experience with the family! How fun! It looks like you had a great time! I would love to experience the food and culture as I’m not very familiar with it. $40 sounds pricey but I bet it comes with a lot of fun experiences. Learning about different culture is so much fun, we learn something new everyday. The shoes on display remind me of the fairy tale story. It’s always amazing to discover how much we are missing in our own backyards! Thanks for sharing! A touch of Europe in the USA, I wasn’t aware of this festival, so cool! North Dakota is one of the few states I haven’t visited yet. This looks like it would be so fun and interesting! I love exploring festivals like this! The foods, the art, the music, etc. Lots of fun and memories to make. Such a neat experience, love the pictures! Thank you foe sharing. How cool is this?! I had no idea that such a festival existed and I LOVE festivals! I am going to do some research and see if we can bead to this next year. Thanks for sharing!! I’ve always wanted to visit Norway; however, knowing that the Scandinavian culture is right here in the U.S. is wonderful. How neat! I have always wanted to visit Norway. I love this! I am from Norway, but my husband is from the states, so we live in PA now. We are going home to Norway to visit in just 2 weeks, and I am beyond excited! It is so cool that they keep celebrating their Norwegian heritage up north! I’d love to go to that celebration some day! love these historic types of festivals! This looks like a fun and educational event. Looks like a really fun festival for family fun! I think I would have been a kickass viking. Scandinavian culture!! Awesome!! I have heard of it many times. I will have to go sometime. Thanks for the info. I love all things Scandinavian. This looks like a great day out. My dad used to go every year with my grandparents. I joined them which happened to be their last year going, it’s such a cool experience! I love to be able to get a visual of history and to experience other cultures. Thanks for sharing and the pictures are beautiful. My Mom would love this! Thanks for writing! Jenna is a USA based blogger and travel nut who is obsessed with planning epic cultural experiences around the world. Read more on the Travels of Jenna About Page. Subscribe my Newsletter for inspiration & expert travel advice delivered straight to your inbox. Travels of Jenna is a participant in the Amazon Services LLC Associates Program, an affiliate advertising program designed to provide a means for sites to earn fees by linking to Amazon.com and affiliated sites.